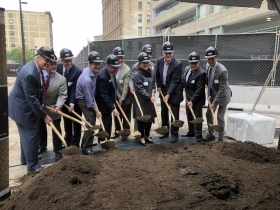 Symphony Breaks Ground on New Hall. Photo by Jeramey Jannene. 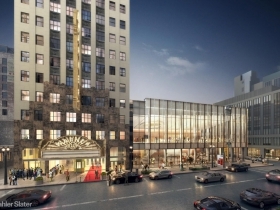 Shovels are in the ground, as the Milwaukee Symphony Orchestra moves forward on its $89 million plan to transform the Grand Warner Theatre at 212 W. Wisconsin Ave. into a world-class music hall. Originally built in 1930, the theater will become the symphony’s dedicated home, with the floors above serving as symphony offices. 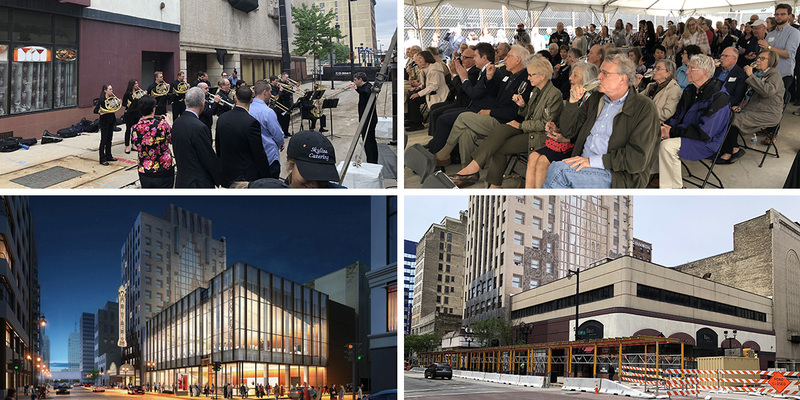 “We call it a groundbreaking, but it is in many ways a rebirth of the neighborhood and a rebirth of the symphony,” said symphony president Mark Niehaus at a ceremony held Tuesday morning. Niehaus singled out a number of key players involved in the fundraising effort, including board president Andy Nunemaker. “It has been a journey of joy, frustration and happiness,” said Niehaus referring to the $139 million fundraising effort the two have led. Niehaus also made sure to praise the project’s most notable donors, David and Julia Uihlein. 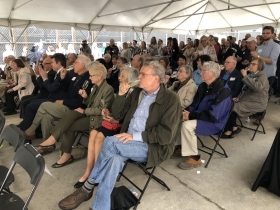 The Uihleins, who rank among Milwaukee’s most prominent philanthropists, have donated to the project three separate times and announced a fourth gift during their speech at the ceremony. In addition, the Bradley Foundation, founded by David’s grandfather, contributed $15 million to the project. Terms of the family donations were not disclosed. How did the symphony get such generous donors? Niehaus called it a project ideally suited to them, a “triple threat,” of music, historic preservation and economic development. The symphony still has almost $30 million to raise to reach their campaign goal. David, an architect, ended his remarks by stating “my message is we are not done yet,” and challenged those in the audience to contribute the remaining funds to grow the symphony’s endowment. Niehaus also thanked Mayor Tom Barrett, County Executive Chris Abele and Alderman Robert Bauman. Barrett praised the symphony’s vision and noted that the effort was a catalyst for the rejuvenation of not just Milwaukee’s main street, but Wisconsin’s main street. “The one constant in this city is that it’s always changing,” said the mayor. Nunemaker was tasked with thanking all of the partners involved in the project, and there are many. He credited everyone from Gov. Scott Walker to the mayor for being good partners in allocating historic preservation tax credits, vacating a street, giving a facade grant and helping coordinate the construction. He also thanked architecture firm Kahler Slater which is leading the project’s design, Mandel Group executive Robert Monnat and Godfrey & Kahn attorney Steve Chernof for serving as real estate consultants. He singled out Niehaus and Susan Loris for their leadership of the symphony. And he also thanked the many donors for making the project possible. Most importantly, according to Nunemaker, he thanked the musicians. “Our musicians are the entire reason we are here,” said the board president. 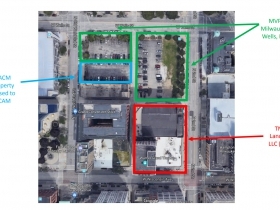 At a mid-May Greater Milwaukee Committee meeting, Nunemaker laid out the symphony’s strategy as “killing three birds with one stone,” and at a bargain price. The organization faced a $3.5 million annual structural deficit according to Nunemaker, and initiated the campaign to reinvent how the symphony operates. 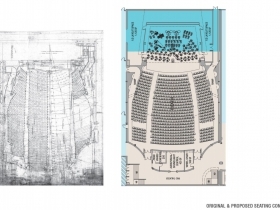 The dedicated building, allowing the symphony to control its schedule, its hall and its parking, is planned to yield the organization an additional $2 million in annual income. Creating a more substantial endowment is planned to yield $1 million annually. And the final piece of the puzzle is stabilizing the employee pension fund, which will save an estimated $700,000 annually. 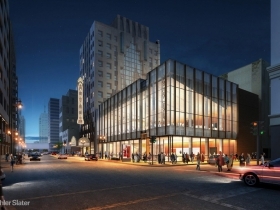 The orchestra has shared the Marcus Center for the Performing Arts with a number of other local tenants, like the Milwaukee Ballet and Florentine Opera, and traveling Broadway shows, since it opened in 1969. Last operated as a cinema by Marcus Corp. in 1995, the building has been vacant ever since. 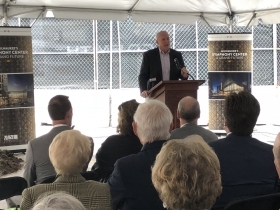 The Marcus family helped get the project off the ground by donating their ownership in the building to the symphony and included an additional donation according to Niehaus. During Tuesday’s ceremony, the symphony president also thanked Paul Bielich for buying the land the building sits on and working to save the theater. “You did it, you saved it,” said Niehaus. 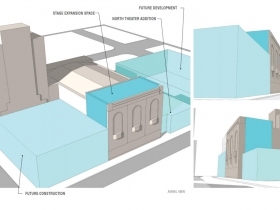 A dizzying array of detail goes into all the moving pieces required to bring the project to fruition, including a planned move in October of the theater’s eastern wall 35 feet east into N. 2nd St. The move is necessary in order to build a stage that can fit the symphony. But in order to qualify for $16 million in state and historic preservation tax credits, the wall must be maintained and moved as one piece. “The National Parks Service wouldn’t allow us to deconstruct it and rebuild it; we have to literally move it,” Chernof told a city committee in May. He noted there are just two companies in the country that do this work, and the MSO has scheduled the move for October because the early fall month is the least windy. To make matters more expensive, no additional tax credits were awarded to assist with the move, said Monnat, in an interview with Urban Milwaukee. 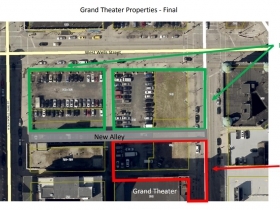 The symphony is also acquiring a small slice of land to the building’s north as part of a three-way transaction that will allow for back-of-the-house functions like dressing rooms and restrooms to be constructed. The symphony’s real estate affiliate, TNSH LLC (The New Symphony Hall), has also acquired the building at 200-208 W. Wisconsin Ave. for $1,238,000. Kiku Japanese Restaurant at 202 W. Wisconsin Ave. has closed as a result of the acquisition. The two-story building will be demolished in July and a glassy lobby will be erected in its place that includes food and beverage space for before- and after-show functions. The existing building was built in 1937 according to city records, but sits on the foundation of the former Loan and Trust Building. The new building will also use the foundation of the seven-story building that was there previously according to Monnat. Adding to the complexity, the theater is part of a 104,955-square-foot, 12-story building. 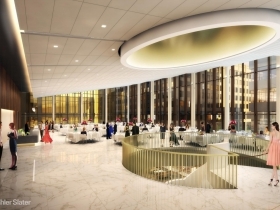 Five floors of the tower will be converted to offices, warm-up space and a reception space for the symphony, while more of the space will be marketed for sale to a developer for a future conversion to housing or redevelopment as office space. For those wondering what the interior of the building looks like, Tour de Force has posted a series of interactive, 360-degree images of the space. Visible among the Art Deco detail is the small stage and remanents of the structure that divided the theater horizontally into upper and lower theaters during the end of its run as a movie theater. 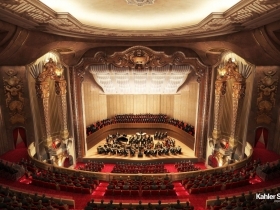 The rationale for the move was discussed in detail in a 2016 story by Bruce Murphy, including that the symphony has long identified the hall as being acoustically well-suited for their use. 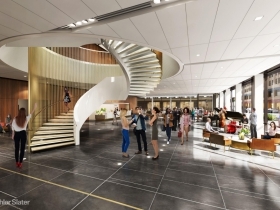 Since they are planning on using the GA parking garage for patrons, they mentioned a skywalk across the Avenue to connect with the second floor of the lobby, I believe. Is that still in the plans? So excited that this is moving forward but, for the love of God, not another skywalk. Activate the streetscape. People in real cities are fully capable of using crosswalks—in all four seasons. I guess Minneapolis isn’t a real city then. Choices are good. Some people prefer to stay warm and dry when the weather is bad. It is a positive feature for Milwaukee visitors. They can certainly walk on the sidewalk rather than wait for the streetcar, too. I don’t care for the way many skywalks look, but I do enjoy keeping my concert-going clothes clean and dry during inclement weather. Walking in slush and ice in heels is not fun, not to mention sitting in downpoured upon wet clothes for a couple of hours while trying to enjoy a concert. “Real cities” with lively downtowns and climates similar to Milwaukee are Chicago, Boston and New York. You see plenty of people walking to live performances from home, mass transit, or wherever they parked without using skywalks. They are smart, practical, city folk who simply dress for the weather. I get that Milwaukee sometimes has inclement weather, but if we’re building skywalks because someone doesn’t walk to walk through slush in heels, then that person shouldn’t wear heels. And, please let’s give snow plows and shovelers credit for pre-event work. People dressed much fancier for the symphony, opera, ballet, etc. decades ago and had absolutely no problem making performances–intact, dry, and delighted. Skywalks downtown are like adding two new lanes to I-94 from downtown to the west side because Milwaukeeans can’t bear their 22-minute rush hour. Both kinds of projects involve planning for the worst case scenario with blatant disregard for the great detriment the projects have on the city the rest of the time. I have been thinking since I read this piece last last week about a possible alternative that might please all parties. How about some sort of transparent covering for Wisconsin Avenue between 2nd and 3rd Streets that would go up the week before Thanksgiving and come down right after Passover? As high as 2-4 stories (perhaps varying in height depending on the location!) It could serve to protect symphony patrons (and others) in the area, maintain a commitment to the street level, and also could serve to feature the activity of the area during the holiday/winder season. Thousands of tiny white lights? A seasonal “winter garden?” A winter counter balance to Greg Marcus’s Sculpture Milwaukee? MidnightSon, while it’s possible that New Yorkers “dress for weather”, they also have weather-proof concert options. NYC’s Lincoln Center complex includes two underground public parking garages (one valet and one self-park) and an underground drop-off area for taxis, Ubers, and private cars. All of these (and the subway) are connected via underground walkways to the Metropolitan Opera House (home to the opera and ballet) and to David Geffen Hall—until 2015 called Avery Fisher Hall—home to the NY Philharmonic Orchestra. Attending a concert dripping wet is no fun; I learned this first-hand last year when my wife and I visited Paris. We had purchased tickets for a symphony concert before leaving the US partly because we wanted to see the new “Symphonie de Paris” concert hall which opened in 2015. (It’s fantastic!). But it rained that night, and it was a block or two from the nearest Métro (subway) so we (and everybody else) got soaked. So, I’d vote for a skyway connecting the new concert hall to the Grand Avenue parking garage. @TransitRider. I hear you. What a benefit to build the venues that comprise Lincoln Center on the Upper West Side and incorporate underground parking garages. I wish MKE had more underground parking garages. There are still plenty of venues in NYC and elsewhere (all of Broadway, Carnegie Hall, etc.) where audience members don’t need skywalks or tunnels to make it to sold out performances. Down here in Chicago, audience members going to Symphony Center need to walk outside about 10 yards from the closest parking–Millennium Park Garages–and the center’s entry. That’s like crossing Wisconsin Avenue. I am super excited about what can happen on Wisconsin Avenue. 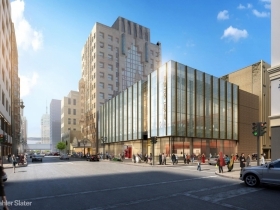 The new Symphony Center is not being created from the ground up, but in an older part of downtown that doesn’t allow for something “Lincoln Center-style.” West Wisconsin Avenue is already on life support. If built, a Symphony Center skywalk would be the fourth to cross Wisconsin Avenue between the River and 6th Street. 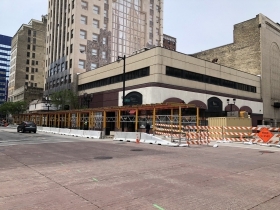 And, if a convention hotel is eventually built on the 4th and Wisconsin lot, there’s a 99% chance that that will mean a fifth skywalk to cross Wisconsin within that six-block stretch. (Unless it is a Marcus hotel connected to the Hilton.) . I believe MKE can do better and should strive to do better. Why not look at temporary covering of a section of Wisconsin Avenue during winter? Why not make it attractive–even delightful–and give street-level Wisconsin Avenue the boost it needs? If not that, how about at least awnings covering the sidewalks along this block, at least during part of the year? Cities have been regretting and rethinking skywalks and tunnels for more than a decade. I would love for Milwaukee to lead boldly and creatively instead of succumbing to old, ineffective strategies.